Career Testing Services Pakistan CTSP Islamabad is one of the best testing service in the Pakistan. CTSP conducts the written and screening test for the jobs, admission and scholarships as well. It has very transparent testing procedure and system. It has been established in March 2017, CTSP self-sustained testing Company conducts tests and assessments for admissions, scholarships, recruitment and promotion purposes. The CTSP Islamabad has announced the Jobs 2019 So they invited the application forms from the candidates who are interested and fulfilling the eligibility Criteria. We are providing you here the Download Application Form at this page you can download the form and then fill the application form carefully after that you must pay the deposit slip in bank branch in the favor of CTSP. Once you will applied for these jobs then CTSP will evaluate the application form and then they will announced the candidates list candidates who are eligible and their application form correct filled their names will be appear in the candidates list once your name will be appeared in the list of candidates then you Roll Number Slip will dispatched to your residential address that you provided on the application form. 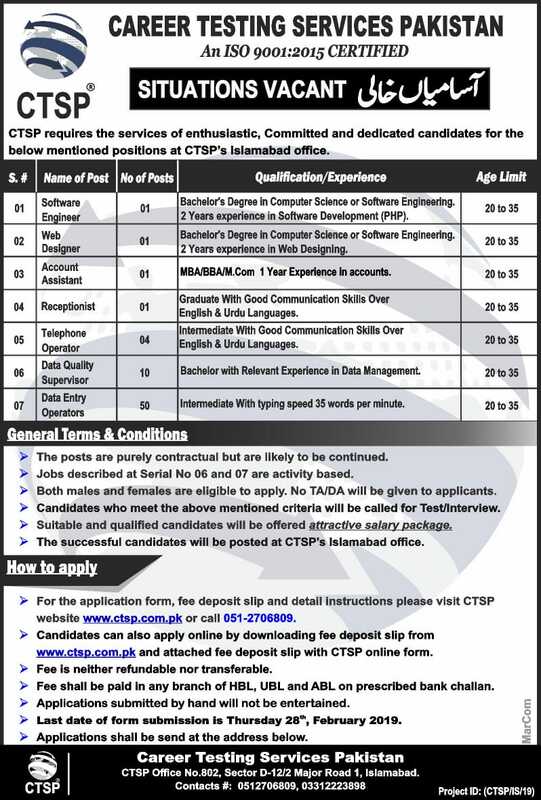 CTSP requires the services of enthusiastic, Committed and dedicated candidates for the below mentioned positions at CTSP’s Islamabad office. The posts are purely contractual but are likely to be continued. Jobs described at Serial No 06 and 07 are activity based. Both males and females are eligible to apply. No TA/DA will be given to applicants. Candidates who meet the above mentioned criteria will be called for Test/Interview. Suitable and qualified candidates will be offered attractive salary package. The successful candidates will be posted at CTSP’s Islamabad office. For the application form, fee deposit slip and detail instructions please visit CTSP website www.ctsp.com.pk or call 051-2706809. Candidates can also apply online by downloading fee deposit slip from www.ctsp.com.pk and attached fee deposit slip with CTSP online form. Fee is neither refundable nor transferable. Fee shall be paid in any branch of HBL, UBL and ABL on prescribed bank challan. Applications submitted by hand will not be entertained. Last date of form submission is Thursday 28, February 2019. Applications shall be send at the address below.